Cara del Indio, Futaleufu River, Chile. I’m a little tired, so I’ll make this brief. 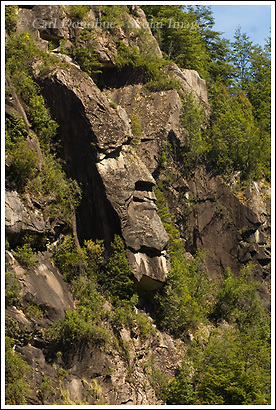 This image is of a rock form called “Cara del Indio”, which translates to english as “Face of the Indian” – because the rock form resembles the profile of face of a wizened old Indian; the native people of this area were the Mapuche, who were mostly wiped out by the Spanish Conquistadors. The word “Futaleufu” by the way, is a Mapuche word that translates as “Big Water”, and yes indeed, the Futaleufu River is Big Water. Chile. PS – Oh, I should’ve added: this feature is just before Mundaca. Generally rafting trips will pull over on to a small beach below Cara del Indio, have a quick rest, and the guides will go over the plan for running Mundaca – it also allows the safety boats, like the cataraft and a kayaker or 2, to get ahead and set up for safety, if needed. This entry was posted in Abstract Photos, Chile, Cool stories, People, Travel on December 29, 2007 by Carl D.